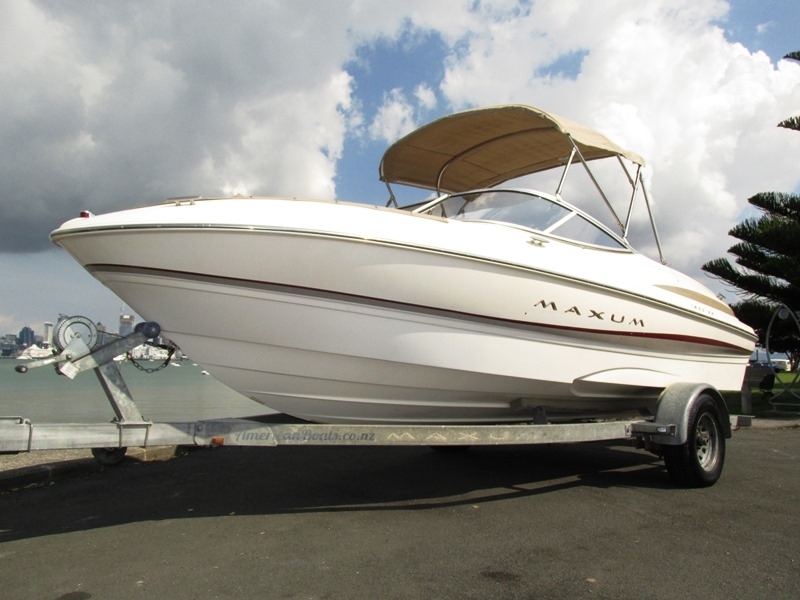 Beautiful 2002 Maxum 18 ft luxury sports bowrider, effortless 190 hp 4-stroke Mercruiser, only 150 hrs, 7 seater, full instrumentation, stereo, electric bilge pump, nav lights, tilt steering, glove box, cup holders, captains chair with bolster seat, removable rear seats that also lift to form a sun lounger pad, underfloor storage locker, walk through windscreen to bow seats, bow cover, bimini top sun shade, storage/road cover, integrated rear swim platform with stainless boarding ladder and ski tow ring. Comes on single axle galvanised braked trailer with submersible led lightsregn and wof. A very tidy example of a popular size luxurious , spacious family boat with loads of effortless power for watersports.